Skybuds: "Exploit the full potential of your wireless Skybuds earphones thanks to the Skybuds app. OUR CHALLENGE: To create a mobile app connecting with wireless earphones via Bluetooth 4.0 and to ensure the..."
Nimblechapps is a good name in the field of wearable app development. We have developed apps for Apple watch and Android watch. PillTaker: "Take the pill has never been so easy. Convenient to use interface helps users easily compose and edit a schedule of receiving medication, and customized notifications will never allow the user to forg..."
MobiDev creates custom software for iOS and Android based Wearable devices as a part of complex software solutions to reach our clients business goals. Threatsream: "On-the-go insight into threat intelligence relevant to you. The ThreatStream Mobile App connects you to the ThreatStream OPTIC threat intelligence platform to access dashboards, threat indicators, ale..."
JellyChip: "Social Network mobile app for the community of people who cares. Users answer survey questions, earn points through the many other ways on the network, spending those points through buying gifts for p..."
Android Wear smartwatches feature always-on displays, so you'll always see important info like time, calls, and notifications. Respond to messages right from your watch, even when your phone isn't with you. Wearable technology is a term that includes all smart devices that are worn on the body as accessories. They are a specific area of the IoT world and some of the most representative examples are smartwatches, smartglasses and activity trackers. Most major players in the technology industry have created wearable products such as Google, Apple, Samsung, Garmin, Xiaomi or Huawei, while new companies have achieved a considerable market share in this niche such as Fitbit or Lifesense. The high amount of platforms, hardware and devices is making choosing platforms and finding an experienced wearable development company for your project a crucial element to the project’s success. Nowadays it makes sense to make a wearable app for different reasons. First of all, because wearables are here to stay. The wearable trend has become a solid one, not only for smartwatches but also for fitness bands. Smart wearable devices like the Xiaomi Mi band or waterproof swimming bands have become affordable for almost everyone. There are every time more apps for wearables that offer functionalities beyond the connection between smartphones and smart bands. Wearables are becoming independent and autonomous and offer features that smartphones can’t. 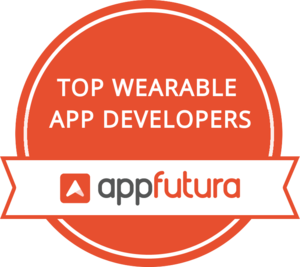 In this directory you will be able to find some of the most reliable development companies in the world with expertise in wearable app development. The AppFutura team strict review system ensures that all reviews have been manually validated by our team. Once you make your choice, you can work safely with that development company using our escrow payment system.